People are getting crafty. In the economic downturn, the do-it-yourself spirit that has always been a part of the indie music and arts scenes has extended to handmade wearables, and even to things like light fixtures and furniture. Magazines like ReadyMade chronicle these inventive creations and festivals have found national audiences. Who’da thought knitting circles would become hip? But they are. Always “in the loop”—whether that includes macramé beer-can hats or needlepoint pieces with unexpected messages—Salt Lake City has its own dedicated group of “handy” crafters who prefer making day-to-day necessity items rather than purchasing them in stores. Craft Lake City, an event presented by Yudu (as in, “what do yudu?”) personal screen-printer company, is a celebration of all the things local craftspeople are doing in this growing branch of self-sufficiency. The 65 artists demonstrating their wares include some of the most noted fine artists in town: painters Gentry Blackburn, Trent Call and Sri Whipple; Women’s Art Center founder Teresa Flowers; mixed-media artist Julie Stutznegger; and Patrick Munger with his brightly-colored Lake of Salt tennis shoes. It will be interesting to see how they work functionality into their artistic palettes. An all-day lineup of local bands warms up the venue for musical headliners, the heavier-thanthou relative newcomers to the area music scene Mammoth at 9 p.m. 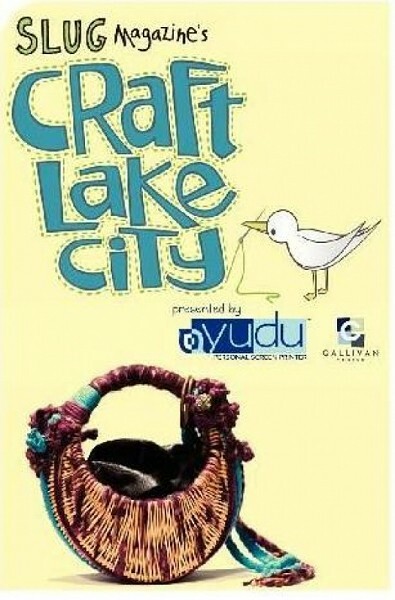 Craft Lake City @ Gallivan Center, 239 S. Main, 801-535-6110, Saturday, Aug. 8, 2-10pm, CraftLakeCity.com.